It’s the city I was born in, and still feels like home to me, having grown up there and also gone to college for 4 years. It’s good to be back for a while. When down at my grandparents’ house, I discovered a few rolls of exposed 120 Kodak Verichrome Pan in my grandpa’s drawer (along with a rather crappy plastic camera…there was a reason I left that one behind, though I’m rethinking that now). I decided to ask around town to see what could be done about getting that film developed and came up with a bit of success. Also rooting through my own drawer at my dad’s house, I came up with a few 35mm rolls that have probably been sitting there since I was in middle school: 2 rolls of Fuji 200 and a roll from Seattle Filmworks. This was way back when I had no idea what the hell I was doing, but evidently I used the good stuff occasionally, even if it was only in my Kodak Cameo thrift-store special. I’ve started doing research on labs doing ECN-2 processing, but don’t know who I would send the film to yet. Does anyone reading this have experience sending in old rolls from Seattle Filmworks that can give a recommendation for a good ECN-2 lab? Since I was going to be here for a few weeks, I thought it would be a good idea to scout out the local photography scene as it stands now, as well as see if anyone could develop those 120 rolls of my grandpa’s. When I left Columbus 5 years ago, I was just getting into film, but The place to go to was Cord Camera, at least according to my dad. They were the first store I sent film to back in 2009. If you follow that link, you’ll see that they’re sadly no longer in business, and it looks like I missed the boat by about 6 months. Cord Camera sends you to the World of Photography, which is actually not too far at all from my brother’s apartment, where I’m writing this now. They do indeed have a good selection of used gear, though their prices do seem to be a bit out-there, but they also start marking down items that have been there too long. Since deciding to build up the Spotmatic as my main 35mm system, I’ve been looking for m42 lenses for a good price. They had a Helios 44-m that I’m still considering. It seems the only place left in town that still does film processing (and not much else) is a printing shop called McAlister Photoworks. They even do 120 film, which is nice to know, but not black & white. I did get a couple recommendations for freelance darkroom magicians, and will have to send my grandpa’s film out to one of them. Other stores I looked in on were the Midwest Photo Exchange which has a good selection of pro film from Kodak, Fuji, and Ilford, and also the Columbus Camera Group quite close to Ohio State campus; they’re notable for operating out of an old smelly church. Lovely place, I’d do the same! They had rolls and rolls of expired (2002?) film for $3.00 a roll, mostly slide film: Ektachrome 64T and Velvia in 120, plus assorted 35mm rolls, even some AGFA Scala. Besides all that, I’ve gone ahead and ordered 2 rolls of Cinestill 800T to try out, I might shoot a roll while I’m here, to mix things up. Already used up a roll of Tri-X and am halfway through some Fuji Superia 800, but haven’t been out the last week. I suppose we’ll see how things go. Again, if anyone has experience getting movie film like Seattle Filmworks developed, I’d love to hear from you, and especially would appreciate a reccomendation for a lab that does ECN-2 processing. …but I’m not accepting defeat either. 1. The film studios didn’t give a damn about partnering with Kodak, and are only buying film under pressure from some certain filmmakers. Not surprising, but still disappointing. 3. “Over the next few years” is a very short amount of time. What will happen after that? It seems that the studios agreeing to buy a certain amount of film stock is a stop-gap measure that has an expiration date. 4. Now the positive side: since Kodak’s business has pretty much leveled out now, they have the best opportunity right now to find stability and a working business model for their chemical imaging. 5. Sale of chemical still photography products hit bottom a year or two back, and is steadily on the rise. Digital has done its damnedest to kill film, but it still hasn’t succeeded, despite its claims. Great artists don’t compromise, and as long as there are those that are willing to stand up, speak out, and fight the good fight, the choice for chemical imaging will remain a viable one. Notice what I’m saying the goal of film users is: choice. Will the masses ever cast away their digital cameras and way of life to usher a renaissance of the all-film age? No. Film users’ goal has not been to stomp out every other way of making images (moving or otherwise), but merely to ensure the survival of a unique way of working, and the results it produces. To do otherwise would be like doing away with a primary color, like yellow. Sure, everyone’s images would become much more patriotic overnight, yet we would all be living in a world with much less depth, less interesting. Half our color palette would be gone! Kodak won’t be making film forever. All their equipment is set up to run high-volume production, and it isn’t cost-effective for them to produce film on a too-low-volume. At some point, they won’t be able to afford the lack of demand and will close down the plant, but they’re not the final film manufacturer. Orwo still makes black & white motion picture film, Ferrania is reopening soon and will make color reversal (and negative). On the still side, there’s again Ferrania, Ilford, AGFA/Rollei, Foma, and several others that are emerging from obscurity (and Fuji, for the time being). Film isn’t going to die any time soon. At the very end of that, there will be plenty of large-format cameras around, and with processes like wet plate collodion one isn’t dependent on a company manufacturing film; all it takes is a supply of glass windowpanes and the knowledge to mix chemicals. It’s been around for 150 years and will last longer than anything else. 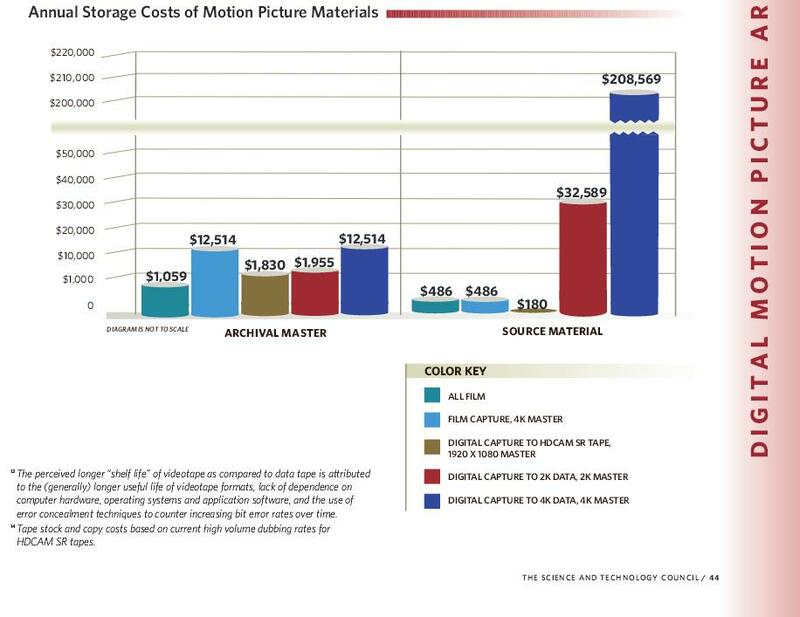 This is from the official report on the cost of archiving digital information, specifically movies, researched by the AMPAS Science and Technology Council. You can read the full report here if you’re interested (also available here). How much work will be lost, because the cost of maintaining it will prove too high, or ultimately unreliable? Films like Citizen Kane, The Great Dictator, Metropolis, A Trip to the Moon, and countless others can be bought and viewed today by anyone, because the film elements have stood the test of time. In a hundred years, will we be able to say that about Russian Ark, the films of Lars von Trier and Steven Soderbergh, or all of the digitally-captured films that will be made this century? Knowing digital’s archival limitations, will films increasingly become cheap throw-away products, a downward creative spiral? I don’t know why so many people think true artists would compromise so fully as to abandon the best medium for image capture that’s ever existed. I’m extremely grateful to the artists in the movie industry that are so powerful that people will actually listen to them. To all the people that speak up on behalf of film, thank you! It’s the most important creative choice available.